SINGAPORE – A full-time National Serviceman died yesterday after experiencing breathing difficulties during training. 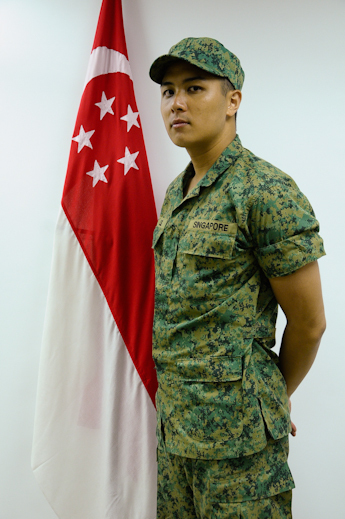 Private Lee Rui Feng Dominique Sarron (picture), 21, a former sprinter at the Singapore Sports School, was participating in a platoon exercise at the Murai Urban Training Facility in Lim Chu Kang. TODAY understands that the incident happened after he took part in a training activity which involved smoke grenades. According to the Ministry of Defence (MINDEF), Lee experienced breathing difficulties at 12.30pm. Three minutes later, he lost consciousness. A Singapore Armed Forces (SAF) medic attended to him immediately. At 12.46pm, he was evacuated via a safety vehicle to Sungei Gedong Medical Centre, where an SAF doctor attended to him at 12.52pm. At 1.03pm, he was conveyed in an ambulance to the National University Hospital (NUH), with an SAF doctor continuing to resuscitate him en route to the hospital. Lee arrived at the NUH at 1.22pm. He was pronounced dead at 2.05pm. Lee, who celebrated his birthday last week, won a silver medal at the 8th Thailand Inter Sports School Games in 2005. Last night, his Facebook page was filled with hundreds of tribute messages from friends who remembered him as an active and cheerful person. Former Singapore Sports School student and sprinter Dominique Sarron Lee died yesterday during national service training. He was 21, having celebrated his 21st birthday just last Wednesday (April 11). Dominique was part of the pioneer batch of 100-odd students who joined the Sports School when it opened its doors in 2004. A former student of Griffin Primary, I remember being told by my Sports School contacts how excited they were at his potential talent and his strapping build. He was the fastest student from Griffin, and there had been among the Sports School coaches and administrators that he would go on to become a fine national sprinter. But Dominique eventually found that there was a limit to his sprinting talent, and he did find himself being overtaken by other sprinters like Calvin Kang and Yusof Azhari. According to his friends, his asthma also played a part in limiting his development. Still, he remained an important member of the school’s 4x100m and 4x400m relay squads. He then went on to Temasek Polytechnic where he not only became a member of the polytechnic’s athletics team but also showed a huge talent for music, and for playing the guitar. He apparently turned out to be a pretty decent footballer too, and even became the goalkeeper for S-League club Geylang United’s Under-18 team. Judging from the messages that Dominique’s friends have left on his Facebook page (search Dominique Lee Sarron), and on Twitter (#superflydom and #ripdom), it is clear that this young man was very much a treasured friend, who touched many people with his outgoing personality, big heart and character. My deepest, deepest condolences to Dominique’s family for their loss. I can only hope that time will heal the pain and heartbreak they must be feeling. As a parent myself, I can understand the grief they must be experiencing. It is not right that parents have to see off their children.